Lindsay Lohan might make the most headlines, but she certainly isn't the only troubled member of the Lohan tribe. From bankruptcy and foreclosure to assault and a love child, the Lohan clan certainly takes the cake when it comes to dysfunctional families. They may have tried to hide some of their darkest moments, but eventually it all comes out, and in true Lohan fashion, this crew does its best to make money off its misfortune. Here are some of the biggest scandals the Lohans tried to brush under the rug. The Lohans have all had their issues with substance abuse, but as the most famous member of the family, Lindsay has made the most headlines regarding her addictions. While her arrest record didn't take off until May of 2007, just weeks shy of her 21st birthday, it seems her bad habits began several years earlier. Her father, Michael Lohan, told The Sun that the rising-star overdosed on cocaine at just 18 years old while filming Just My Luck (2006), shortly after he and then-wife Dina Lohan split. Lindsay allegedly got the drugs from one of her assistants who was with her on set of the film in New Orleans. Recalling the incident, Michael said, "I was so angry I got a gun from the house and planned to go to New Orleans to kill him." While Lindsay did not address her father's comments, in an interview with Piers Morgan (via the Daily Mail) in 2013, she claimed the first time she did cocaine was the night she was arrested in 2007 and had only used it several times in her life. That tally turned out to be a lie. Lindsay admitted during an interview with Oprah in 2013 that she snorted cocaine between 10 and 15 times throughout her life. Even this celeb failed to escape the millennial curse of being forced to move back to her childhood home when she should be adulting on her own. A source told Radar Online the actress could no longer afford living in Los Angeles and was forced to move back into her Long Island home with her mom. Aside from not having enough money for a deposit or rent, the insider claimed Lindsay's credit score prevented her from getting approved for most apartments. "In the past, Lindsay has managed to rope in another person to co-sign on leases… However, she couldn't find anyone willing to do that now as she has burned so many of her friends and associates." Around this time, Lindsay was also reportedly in a bit of trouble with the IRS. According to the Daily News, she owed more than $200,000 in taxes, prompting the IRS to freeze her bank accounts. Another source told Radar Online that an embarrassed Lindsay begged a friend to let her crash at their Soho apartment: "It's only a matter of time though before Lindsay wears out her welcome, as inevitably always happens, because she is a total slob and smokes like a chimney." After Dina and Michael decided to go their separate ways, it seems Dina's pocketbook took a hit. Choosing to stay in the house her children were living in, she reportedly had trouble coming up with the money to pay her mortgage. According to The Long Island Press (via the New York Daily News), Dina borrowed $40,000 from Lindsay in 2012 to avoid eviction, but the money was only a temporary fix. Just a year later, the bank reportedly filed paperwork to foreclose on the home after Dina failed to follow through on the terms of her mortgage. It seems some kind of agreement was reached, but the stability was short-lived. According to Realtor.com, after Dina failed to appear in court, JPMorgan Chase Bank was granted permission in December 2016 to sell her house at auction. The 4,119-square-foot, Colonial-style home in Merrick, N.Y. is "estimated to be worth about $892,782—considerably less than what Lindsay's mom borrowed on it," reported Realtor.com. At the time of this writing, the home has not yet been auctioned, but it's safe to say that Dina has probably either packed up and moved out or is waiting for Lindsay to bail her out again. While it's no secret that Michael had several affairs throughout his marriage to Dina, most people don't know that one of those dalliances produced a child. Ashley Horn was born after Lindsay's sister Ali and before her brother Cody, but the love child didn't meet her biological father until she was 17. According to E! News, Michael appeared on The Trisha Goddard Show alongside Horn and her mother, Kristi Horn. Michael took a DNA test, and after the show's host confirmed he was the father, he finally acknowledged Ashley as his child, after years of allegedly refusing to pay child support. According to TMZ, Lindsay knew about Horns' paternity suit but didn't know her father had taken a DNA test until the story broke. What an awful way to find out that you have a half-sister! TMZ said, "Lindsay has no ill feelings toward Ashley—but finds the entire situation 'disgusting.'" They say imitation is the sincerest form of flattery, but LIndsay's half-sister, Ashley, may have taken things a bit too far. After DNA results confirmed Michael was her dad, the teen allegedly underwent a slew of surgeries to look like her famous sibling. Ashley told InTouch Weekly that she opted for rhinoplasty, fat injections in her chin and cheeks, and refinement of her cheeks and jawline. "My goal was to look like Lindsay in her good days, when she was around 18, 19 years old," she said, adding that post-surgery, she's "hotter than Lindsay." After the InTouch story was published, Ashley returned to The Trisha Goddard Show, claiming that her interview with the magazine was taken out of context and that she didn't undergo surgery to try to look like her estranged sister. Horn even took a polygraph test, which she passed. Ashley delivered a message on the talk show to Lindsay: "Whether she saw it or not, whether she sees this or not, I want to say that I am so sorry for letting the media use me to drag you into this. It was not my intention." If Lindsay was considering meeting her half-sister, this debacle likely sent her running in the other direction. Most folks remain relatively private about their list of sexual partners, but unfortunately for Lindsay, her entire tally was revealed to the world in 2014. According to InTouch Weekly, a source gave the tab the handwritten list after spotting Lindsay giggling over it with a friend at the Beverly Hills Hotel. The source claimed Lindsay was bragging to her pal about sleeping with a slew of A-list celebrities, which allegedly included Justin Timberlake, Zac Efron, and Heath Ledger. After that conversation, Lindsay supposedly tossed the list aside, where it obviously fell into the wrong hands. Lindsay was filming her documentary series Lindsay, which premiered on OWN, when the story about her sexcapades broke. Her reaction was heartbreaking: "The fact that that happened was not only humiliating, but just mean," she says on the series. Lindsay later appeared on an episode of Watch What Happens Live, admitting that the list was real but was compiled as part of her rehab process. "That was actually my fifth step in AA at Betty Ford. And someone, when I was moving during the OWN show, must have taken a photo of it. And so that's a really personal thing and it's really unfortunate…"
Clearly, someone is lying about how the list was acquired, but it clearly wasn't meant for public consumption. Lindsay's relationship with wealthy Russian real estate mogul Egor Tarabasov was rocky from the start. She accused her much younger beau of cheating on her with a Russian prostitute in a social media fit. 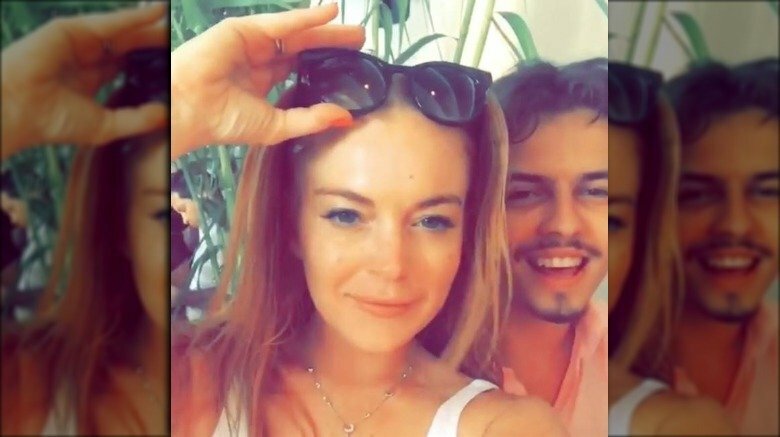 Around that time, Radar Online released a video allegedly showing Tarabasov wrestling a cellphone out of Lindsay's hands during an argument on a beach. In an interview with Russian television Channel One (via Vanity Fair), Lindsay revealed why she and Tarabasov called off their engagement and made some very serious accusations. "I went to bed, and he broke into my house. He started strangling me. I feared that Egor may splash acid in my face. I jumped out to the balcony and shouted with all my force, 'He's trying to kill me, call the police!'" she said. A video filmed by a neighbor allegedly shows the couple arguing on a balcony; Lindsay can be heard screaming for help and telling someone to get out of her house. She's also heard saying, "He just strangled me. He almost killed me. Please please please. He just strangled me." After the incident made headlines, Lindsay posted a photo on her Instagram that showed a large bruise on her forearm, which some believe is proof she was a victim of domestic violence. Tarabasov denied all of Lindsay's accusations and said no charges were brought against him. "'I will not be making any more statements with regards to my former relationship with Lindsay, but I will use all possible legal means to protect my name and reputation," he said. 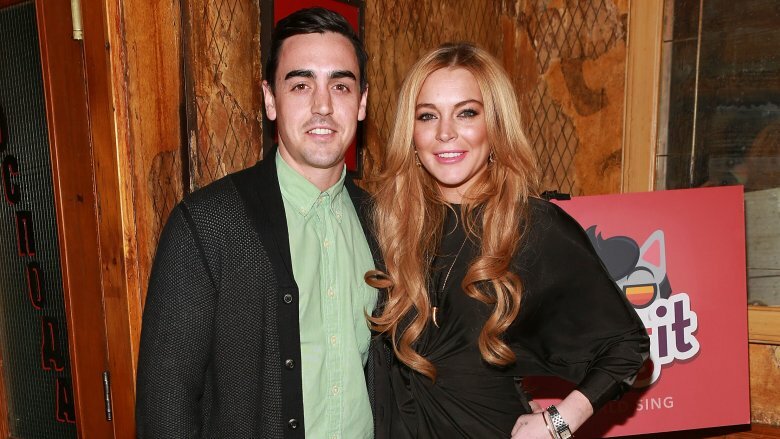 Typically the more low-key member of the Lohan bunch, Michael Jr. was accused by a former business partner of stealing ideas. According to Page Six, Fima Potik filed a $60 million lawsuit against Michael Jr. and older sister Lindsay for allegedly stealing trade secrets and advisers from Potik's online shopping company, Spotted Friend, and using them to start their own biz. It seems the Lohan siblings were working with Potik on Spotted Friend, along with another friend of Michael's. A confidentiality agreement was reportedly signed before Potik gave his colleagues access to software, a list of advisers, potential revenue information, and a beta version of an app. The app was designed to allow users to view celebrity closets and purchase some of the items. After a falling out between Michael Jr. and Potik, the Lohans reportedly left the team and launched their own app called Vigme, which provided similar services. According to Page Six, the Lohans were court ordered to temporarily stop working on their "virtual closet" app in October 2014, but by August 2016, the tables had turned. Potik was reportedly ditched by his legal counsel over unpaid fees, and the Lohans supposedly sought "to fine and potentially jail" Potik for "falsely claiming they stole his idea for the online-shopping app," reported Page Six. The entire case was reportedly dismissed. According to Page Six, Michael Jr. was arrested in 2015 for displaying a forged New York State Executive Branch plaque in his Audi's windshield to allegedly avoid having to feed the parking meter in Manhattan. Junior could not prove he worked for the state and was charged with criminal possession of a forged instrument and criminal impersonation, reported Page Six. Michael Jr.'s defense said he didn't "intentionally" violate the law and claimed the arresting officers searched his car without a warrant. He refused to accept a plea deal in December 2015, and by February 2016, a Manhattan judge dismissed the charges in exchange for four days of community service. Paris Hilton's little brother, Barron Hilton, was viciously beaten at a party in Miami in 2013. According to TMZ, Barron was allegedly talking trash about Lindsay, who was staying in the home where the party was taking place. Barron told police that Lindsay confronted him with a male friend, who proceeded to beat down the hotel heir, allegedly at Lindsay's request. Lindsay insisted she had nothing to do with the assault and had left the party before it even occurred, but video footage showed Barron confronting Lindsay after the beating. After Michael's marriage to Dina imploded, he began a relationship with a woman named Kate Major. They wed and had two sons together, Landon and Logan. According to TMZ, after a nasty argument in 2015, police were called to the couple's home and a then-2-year-old Landon and 10-month-old Logan were removed by the Florida's Department of Children and Families and held in state custody until a responsible adult could take care of them. Grandma Marilyn Lohan got involved, flying from Long Island to Florida to temporarily care for the kids, reported Page Six. Michael blamed his estranged wife's alleged drinking and drug use for the family's foster care situation and even claimed his ex, Dina, "would be more than happy to take care of my kids for me." Rumor has it that Lindsay has a habit of conveniently finding ways to avoid paying bills. At Crown Bar in Los Angeles, People reported that Lindsay was seen going into the kitchen and grabbing two bottles of expensive champagne. According to a source, "When the bartender gave her a bill, she had a meltdown…" A witness claimed the actress left the bar crying and insisting that she shouldn't have to pay for drinks. According to TMZ, Lindsay racked up a $40,000 tanning bill over the course of two years with Tanning Vegas, and she was reportedly asked to leave the popular Chateau Marmont Hotel in West Hollywood after not paying her $45,000 room service bill. A letter from hotel management, acquired by TMZ, said Lindsay was banned from the property. Yikes! 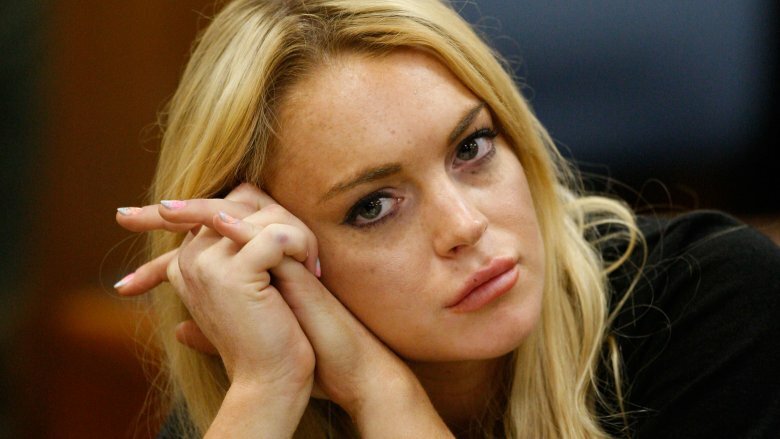 Aside from bailing on her bills, Lindsay has also been accused of stealing jewelry on multiple occasions. In 2011, Lindsay was accused of stealing a necklace worth $2,500 from a boutique jewelry store in Los Angeles. The yellow diamond necklace was spotted in a photo taken by the paparazzi, prompting police to investigate the actress. According to TMZ, the boutique owner had helped Lindsay try on diamond necklace and several other pieces. When the shopkeeper refused to lower the price of a ring for Lohan, she allegedly put her own jewelry back on along with the diamond necklace. The owner reportedly thought Lindsay had taken the necklace accidentally and would return it. The star did no such thing, but when police began digging, one of Lindsay's associates reportedly returned the necklace to the shop, offering no "explanation about why she had the necklace other than to say she didn't steal it," reported the Los Angeles Times. Lindsay was charged with felony grand theft. She pleaded no contest and was sentenced to 120 days in jail. 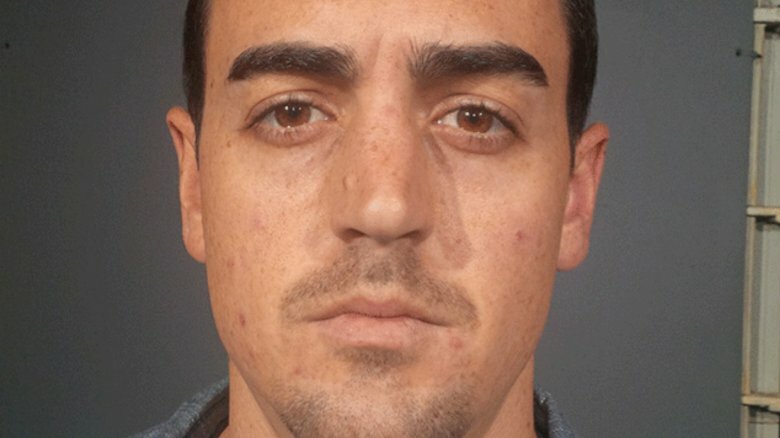 Lindsay was also investigated in 2009 when $410,000 worth of jewelry disappeared from an Elle photo shoot, and in 2012, her friend, Sam Magid, accused her of helping steal $100,000 worth of watches and sunglasses from his home. According to ABC News, Lindsay was sued by a college student in 2008 who claimed the actress stole and wore her $12,000 mink coat, and in 2010, she was questioned by police in connection with a stolen $35,000 Rolex. Lindsay was not charged in those cases.